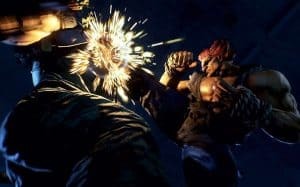 Tekken 7 U.S. Release Date Set for June | Nerd Much? Bandai Namco has finally announced an official Tekken 7 U.S. release date, and we now know that the game will launch on June 2, 2017 for the PS4, Xbox One, and PC, just a couple weeks before E3 2017. The game will come with a plethora of pre-order options, including a Tekken 7 Collector’s Edition that will include a 12″ x 18″ statue featuring Kazuya fly kicking Heihachi in mid-air, as well as a Tekken 7 Steel Book and the game’s soundtrack. The Collector’s Edition will only be available for PS4 and Xbox One. There will also be a Tekken 7 Season Pass that will grant players access to three DLC packs that will include new characters, stages, a game mode, costume packs, and a bonus 35-piece Metallic Costume Pack. Of course, players can also simply choose to purchase the game’s DLC packs separately as well. Those who pre-order Tekken 7 will get access to Eliza from Tekken Revolution. Plus, if you are an Xbox One owner, you’ll also get access to a free copy of Tekken 6 (which is backwards compatible). The special Digital Xbox One pre-order pack that will be made available on January 31st on the Xbox Store. Otherwise, the Digital Deluxe Edition will be made available for PS4 and Steam users. But if you’re a PS4 gamer and are feeling a bit shafted, fear not. Tekken 7 will have exclusive PS4 content including legacy costumes from Tekken 4 and Tekken 2 for King, Xiaoyu, and Jin, and there will be a Jukebox Mode that allows players to listen to old Tekken jams and create their own playlists to listen to while playing the game. Tekken 7 is the most-anticipated fighting game of 2017, and it’s on our list of the most anticipated upcoming games of 2017. Stay tuned to Nerdmuch.com for more.